Sunday 24 March 2013 was the date of the Eastern & Mountain Districts Radio Club White Elephant Sale (WES). The plan was to get to the event primarily to catch up with people. A secondary plan was to hopefully Chase some SOTA Activators. An optional extra was to possibly activate a summit or 2 on the route home. Departure from home was later than planned, but the trip to Melbourne uneventful – along the Princes Highway, then the Monash Freeway and Eastlink. The trip up Eastlink required one to be wary of spectators pulling up quickly from the right hand lane onto the median strip – the Melbourne Ironman Triathalon cycling leg was in progress on the southbound lanes. After arriving at the destination venue, I found a car park, switched on the HF radio at around 2323Z (23/03) and could hear Andrew VK1NAM/p on VK1/AC-039 working stations, just on the small HF whip on the car. I took my chances and gave Andrew a call. Contact was made, despite my weak signals to Andrew. I went into the WES and had lots of chats with people whilst trying to look at what was for sale. At about 1115 local, I went back out to the car. I could hear the activity, but signals on the mobile whip were very low, so I set up the 40 m inverted V on the squid pole, hooked up to the IC-706MKIIG in the car. Made a repeat contact with Andrew VK1NAM/p on the new UTC day, and then worked VK1DI/p on Pheasant Hill VK1/AC-021, both despite the local power line noise. I checked APRS to see how Allen VK3HRA was progressing towards his summit and saw that he was a long way off, so pulled the antenna down & packed up, then back inside the WES to chat with more people. I left the WES at about 1230 local. Back at the car, I heard people working Allen, so quickly set the inverted V back up and worked Allen on Gurdgaragwurd/D’Alton Peaks VK3/VW-001 at 0144Z. As the southbound lanes of Eastlink would be closed all day, I decided to head for the hills for the longer drive home. 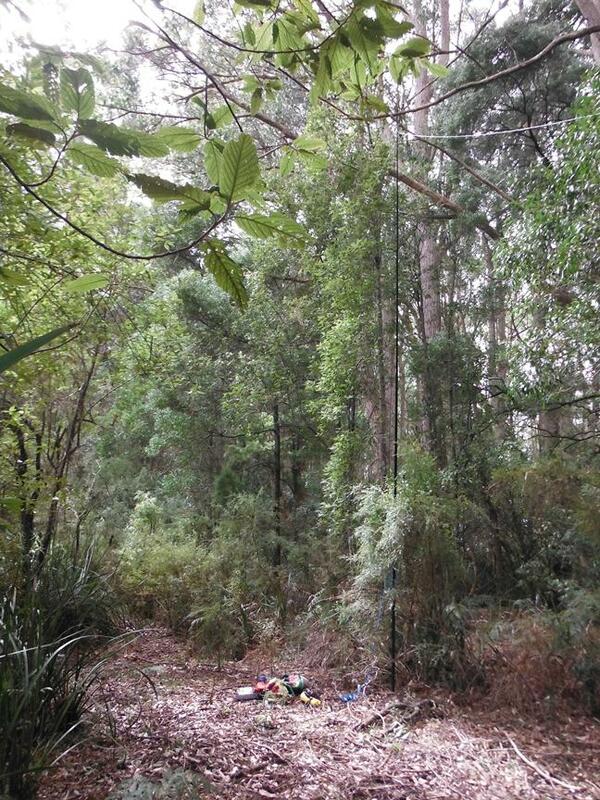 Mt Toolebewong operating site: The small clearing beside the track just before the private road sign. 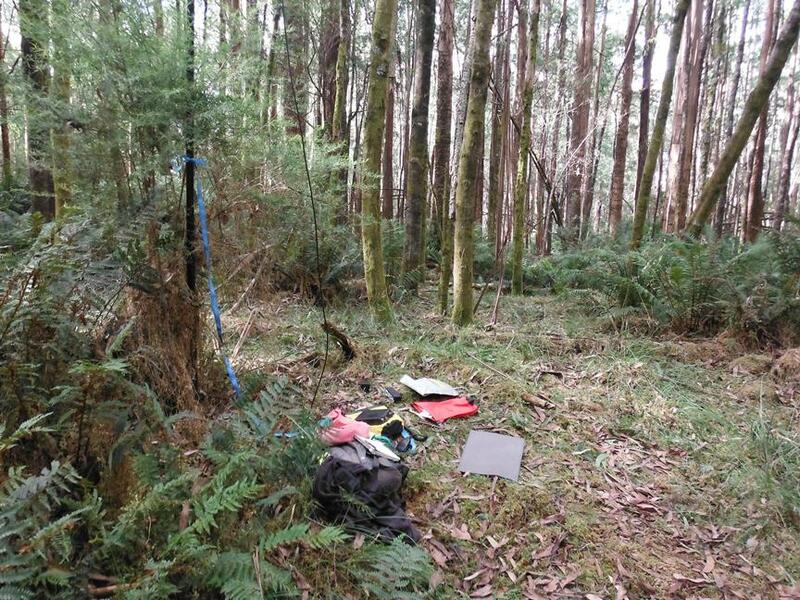 I headed to Healesville and Mt Toolebewong VK3/VC-033. It turns out that I largely followed the description given by Glenn of his activation. I had not read Glenn’s write up until this evening, after getting home….. Worked 6 stations to comfortably qualify the summit. Heard Andrew VK1NAM comfortably at 53, but he could only just hear me in the noise with difficulty, so no contact. Sorry Andrew! Packed up and headed for Mt Bride. Operating position at Mount Bride – a clearing just to the east of the track, slightly south of the actual summit. The start of the track is narrow, but I saw evidence of trail bike activity recently. There is plenty of space to park the car off the track just east of the track junction. The initial section of the track is steep, but tehn becomes less so and a little more open. It took me about 20 minutes (IIRC) to walk up to the summit area from the start of the track. Like you I found some nice open areas on the left (East) just where the track started dropping off slightly, but within metres vertical of the flat summit. I set up there and started activating. Switched on and hear Ian VK5CZ/p calling CQ. I thought I might have a chance of an unexpected S2S, but Ian was in the backyard. Still a good contact. Glenn called me over Ian, but stood by while I completed the contact. I worked 13 stations in 30 minutes. Then packed up and headed back to the car – only 10 minutes down the hill. I then followed the same route as Glenn followed toward Brittania Range VK3/VC-011, except I decided to give the track a try in the car – a 1997 Subaru Forester with dual range gearbox. The spoon drains were somewhat fearsome – some of the most extreme examples I have seen. Hit bottom a couple of times, but not heavily, as I was taking it easy in Low Range. Got to the top of the road OK & checked the maps. Decided that the high point in the road, close to the bulldozer workings, was just inside the activation zone. Drove the car down the track to well below the activation zone walked back up with the gear. I set up on the side of the track, beside the ‘dozer workings. Called for a while after self-spotting before Glenn called me. Then worked VK3DET and then no response to calls. I re-oriented the inverted V, and then worked another 5 stations in about 9 minutes. A good day – 3 summits chased and 3 summits activated in addition to catching up with many people at the WES. This entry was posted in SOTA and tagged VK3/VC-009, VK3/VC-011, VK3/VC-033. Bookmark the permalink. You did well on the Britannia Range track! I need a car like that! The car helps, but you also need to drive with care! The old Subie Forester is small, nimble, light & maneuverable, all of which helps!